The LAG Living Kainuu LEADER works in eastern Kainuu along the Russian border. Most of the area is very sparsely populated wilderness with a wide range of wild animals, reindeers and beautiful scenery. 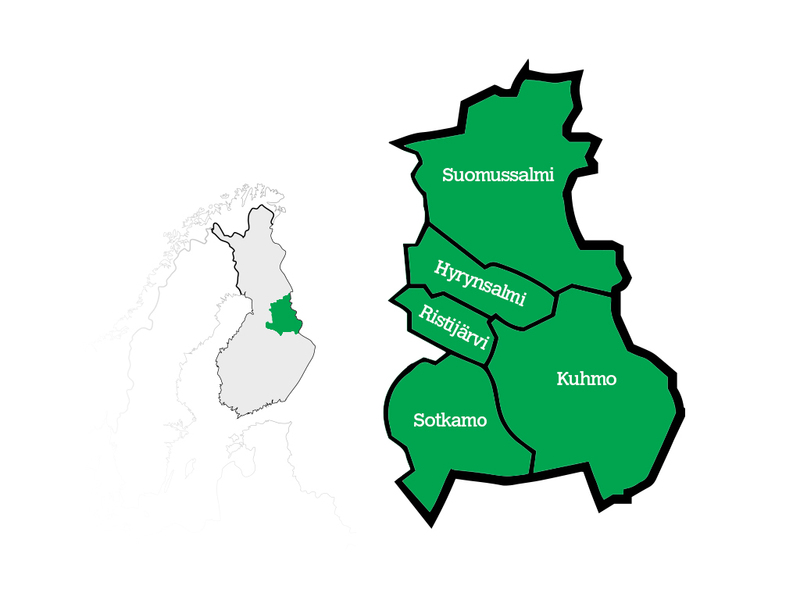 The LAG consists of 5 municipalities: Hyrynsalmi, Kuhmo, Ristijärvi, Sotkamo and Suomussalmi. The total area of the Lag is 16.685,57 sq-kms, and the total population (stat.info 1/2016) is 31.392. The biggest municipality is Suomussalmi areawise, and the most populated is Sotkamo. Lag Living Kainuu LEADER NGO (in Finnish Elävä Kainuu LEADER ry) realises its CLLD (= Community Lead Local Development) /Leader-program called "Leave no-man behind!" (in Finnish "Kaveria ei jätetä". The origin of the phrase is in war times, which even in not-so-faraway history has made people in LAGs area struggle, but mostly, luckily, survive both at home and in the frontline. The strategy is a commonly, with local actors and inhabitants, written program of local needs and possibilities fitted into targets for financing and co-operation with all the bodies needed. The association of LAG Living Kainuu has closed a deal with the Ministry of Forestry and Agriculture of Finland about running the program and getting a yearly funding for it. The funding, totalling to 3,65 million euros, consists of eu-funding (42 %), national funding (38 %), and the rest is from our municipalities (20 %).One of the main principles in Leader-activity is the communality, the social aspect. The target is well aided this program period, as all the private funding in projects run by non-profit organisations can be fulfilled by voluntary work. a) new kinds of forestry entrepreneurship (looking after forests and scenery, new ways to produce and exploit bioenergy, innovative processing of raw materials from forests and marshlands). We are interested in co-operation with other LAGs in Finland and in any other country on these priorities. Also projects utilizing other monetary sources than EARD are acceptable to us. We have e.g. a PIC-code ready.